Whatever your wind damage restoration may be, we understand what it takes to address each situation. 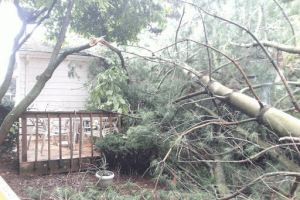 Wind damage can be very diverse, from very minor to extreme instances. From loose siding or shingles, to structural damage. Our experienced Carpenters as well as the emergency response team know exactly what it takes to asses the issues. Like most weather related issues, wind requires immediate action, sometimes tarping or boarding areas of your home to prevent further and avoidable damage. Wind damage is usually caused by the effort of extreme weather. Sometimes even from falling objects such as trees. We also take other factors into consideration by assessing how the weather has affected your home, and how it can be prevented from happening again.